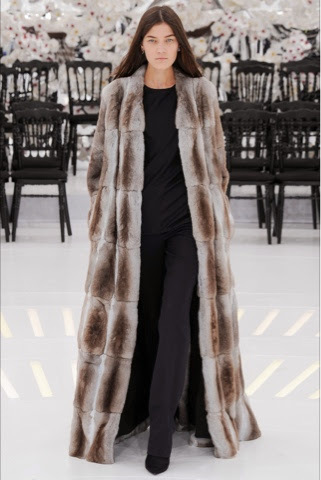 Paris Haute Couture Week runs from the 6th of July until the 10th and designers flocked to the fashion capital to showcase their Fall/Winter 2014/15 collections, out of the many collections exhibited I decided to showcase my favourite pieces here. Since the week is not over yet I decided to show pieces from only the first few days, as there will be two instalments in this and pieces will be shown not as a countdown, but from the chronological order of the shows. Thus the first pieces I have to show are from the Atelier Versace Haute Couture Show. The pieces comprised of this collection were edgy, dark and sensual. 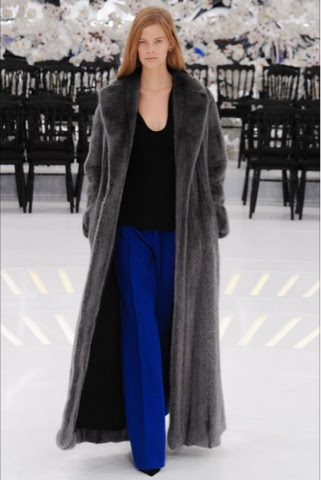 Nearly every look had an array of cut outs, many of them at the front, rather than the back, the colours prominent in the show were of blues, black, purple and white. As seen below corsets were a main component in the structure of many of the dresses, as was the use of crystals, metals, satin and leather. While the torsos of the pieces were tight, bustier style, the skirts were heavily draped and non symmetric. This collection for me shows that Haute Couture can be modern and edgy while still retaining the traditional qualities of the craft. 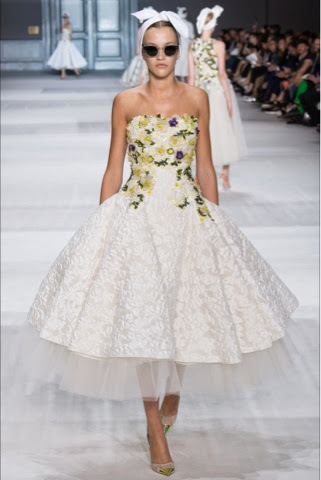 The pieces then transitioned into late 40s to 50s style dresses, which were seen straight or with a slight flair in them, of course reminiscent to Diors past. Next in the line was a homage to the 60s to early 80s deep enthusiasm with space and displayed the astronaut (or cosmonaut, whichever you prefer saying) suit, a jumpsuit with a workforce feel to it, mainly due to the (immensely glamourised) belts and amount of pockets and zips the look had, along with the shrugged gloves. Through the line the pieces have been kept 'young' with variants such as the colours, primarily being white or an icy pastel and with the delicate embroidery, this is also seen in the last few looks of the section, miniskirts, sheer tops and cutouts, yet still being tied in with the previous looks with the colour palette and embroidery. 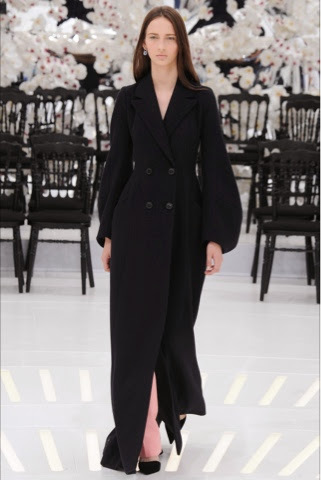 I love the Christian Dior collection and while it's Haute Couture it is one of the most wearable ranges, I can easily imagine Angelina Jolie or Victoria Beckham in the long black coat pictured above or someone along the likes of Elle Fanning or Chloe Grace Moretz wearing their mini skirts, it's simply a beautiful line. 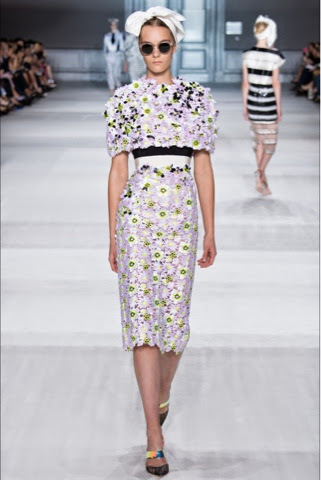 My next favourites come from a designer I have to admit I have never payed much attention to, but after this I will make sure I do, Giambattista Valli. 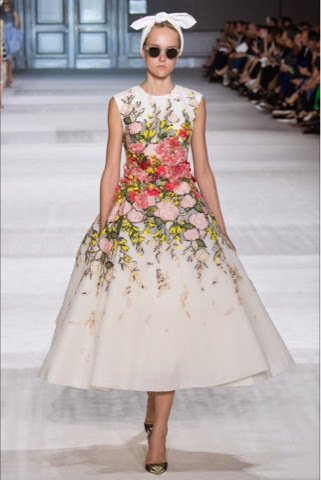 The Giambattista Valli Haute Couture Fall/Winter collection has a quirky edge to it. 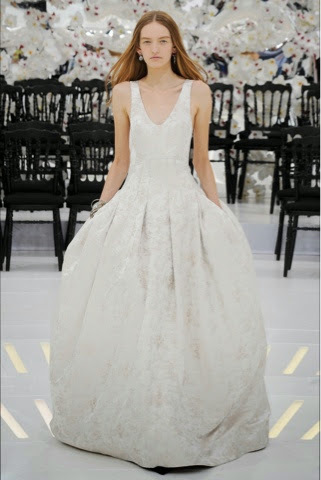 Many of the pieces are white, with a lot of sheer elements and tuelle, which have flowers appliquéd on top. Some of the flowers are not appliquéd but actually skilfully embroidered, in one specific piece I adore how the flowers gradual have a higher relief the further you get to the waistline, which draws the eye in and is actually very flattering. A quirky and fresh brand, I could easily imagine Florence Welsh wearing one of their pieces. 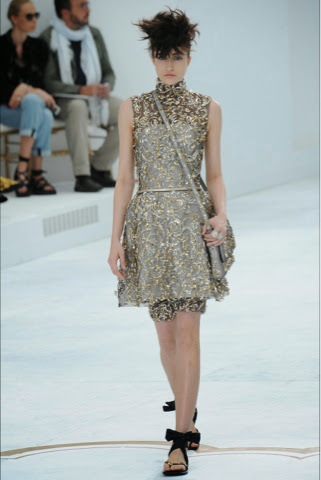 Of course, what would be Paris Couture Week without Chanel? As I said earlier, through the years Largerfeld has reinvented the image of Chanel while staying true to the brand, such as the fact that tweed, organza and cashmere are still highly used fabrics in the range and short skirts and dresses are just as prominent, but the pieces are aimed at the ever increasing young clientele. 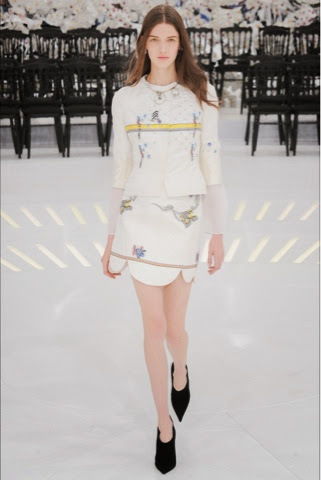 It is another Chanel Haute Couture show that has seen an absence of heels, but instead sandals. Many of the pieces have accentuated waistlines and strong shoulders. (due to shoulder pads) The line has a very baroque feel to it, with heavy embellishments present. 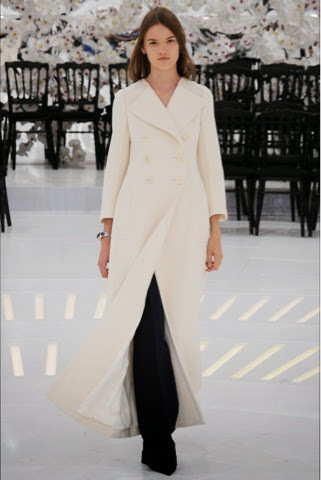 Coats being worn as dresses is another huge trend seen in this show too, but it is not just the coats that have trench shorts under them, but actual dresses as well. Many of the dresses are above the knee and the colour palette is cool, the embellishments do the work. The opposite can be said for pieces in the Giorgio Armani Privé Haute Couture show. It consists of three colours, black, red and white, the colours and the fact that many of the pieces have shorts give it a very sensual theme. Embroidery is not a huge element at all in this line, rather heavy materials. Large shoulders are again prominent in this collection as it accentuated waists due to peplum tops and coats and short aline dresses. This line overall has a very 60s and 70s inspired look to it, with a hint of Asian influence due to the high rounded necklines. I'll be doing a second follow up to this, of collections that have come out midweek or have not yet come out in a couple of days. Stay tuned!